No matter what the occasion, food brings people together. Even if your event venue has amazing views or stunning décor, it’s delicious food that makes your event unforgettable. Whether you’re organizing a big corporate event, a wedding, or an intimate gathering, you need to think carefully about the menu. And it’s not just about the food itself—from the presentation to the service, your guests deserve the best experience. We’ve rounded up seven of the coolest event catering trends right now. Incorporate these ideas into your next event to ensure you and your guests have an unforgettable (and delicious) night. 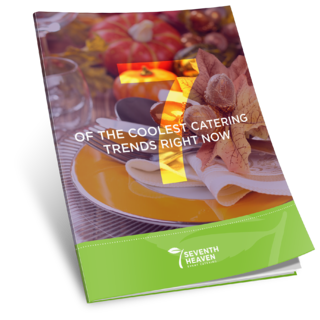 Download this whitepaper to learn more about the coolest catering trends right now.